The first step of making borax crystal snowflakes is to make the snowflake shape. Cut a pipe cleaner into three equal sections. 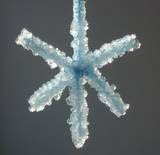 Twist the sections together at their centers to form a six-sided snowflake shape. Don't worry if an end isn't even, just trim to get the desired shape. 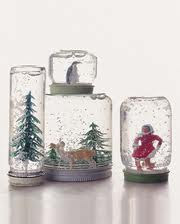 The snowflake should fit inside the jar. Tie the string to the end of one of the snowflake arms. Tie the other end of the string to the pencil. You want the length to be such that the pencil hangs the snowflake into the jar. Fill the widemouthed pint jar with boiling water. Add borax one tablespoon at a time to the boiling water, stirring to dissolve after each addition. The amount used is 3 tablespoons borax per cup of water. It is okay if some undissolved borax settles to the bottom of the jar. If desired, you may tint the mixture with food color. Hang the pipe cleaner snowflake into the jar so that the pencil rests on top of the jar and the snowflake is completely covered with liquid and hangs freely (not touching the bottom of the jar). Allow the jar to sit in an undisturbed location overnight. Borax is available at grocery stores in the laundry soap section, such as 20 Mule Team Borax Laundry Booster. Do not use Boraxo soap. Because boiling water is used and because borax isn't intended for eating, adult supervision is recommended for this project. We made home-made snow globes today!!!! It is that time of year again and to me its always a great time for fun sciency Christmas crafts. So I decided to let the kids make a snow globe. It was pretty easy to make after we cleaned a couple of spaghetti jars up, all they had to do was glue some plastic holiday ornaments to the lid. To make the snow I had them crush some cleaned eggs shells in a bag and pour with glitter into the jar. The of course we filled with water and glued the lid on.